Mobile is where it's at! Flurry Analytics reports that 86% of time spent on Connected Devices is through Mobile Apps while only 14% is spent on a web browser. With 30 years information technology experience, we can help you get your business into the mobile world with a downloadable app from the iTunes or Androide store. 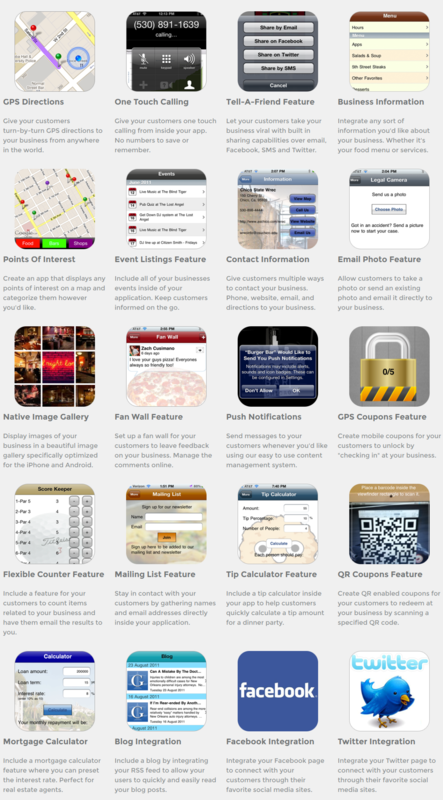 With robust features such as GPS to find your store, One-Touch Calling to instantly give you a ring, Push Notifications to stay in touch with those who have downloaded your app, Social Media Integration, Image Galleries, Tell a Friend, and coupons features, this is a must have to stay a step ahead of your competition! Special discount pricing for OC Brides Members. Once your app is created, our consulting staff can manage your app for a nominal monthly fee or teach you to manage it yourself. Pricing based on project. 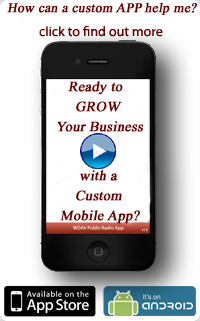 Each APP is custom.